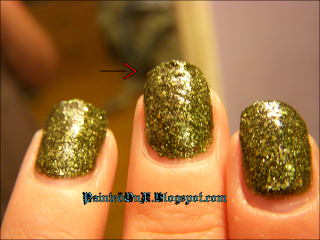 After doing my nails in Worth The Risque I was thinking that I had a few colors that may be comparable dupes. You can see they do have their similarities. However in different lighting each one shows it's uniqueness. With "Worth The Risque" you can see there is more of an apparent rainbow effect. On Milanis - HD it's less obvious that it's holographic than WTR, there seems to be more speckled or scattered holographic pieces of glitter. This also took 4 coats. Last is OPI- DS-Coronation, similar to HD but it has way more of a pay off, it looks as if it's packed with holo glitter and a scattered rainbow effect unlike WTR. I'm liking Worth the Risque may more. This is one of the only Holographic polishes I have..and It's only semi holo. Nothing compared to my OPI DS-Signature or Coronation. I was never lucky enough to get anything from the China Glaze Kaleidoscope or OMG collections. Throughout all of the swatches I've seen of China Glaze OMG, Worth The Risque does not compare. 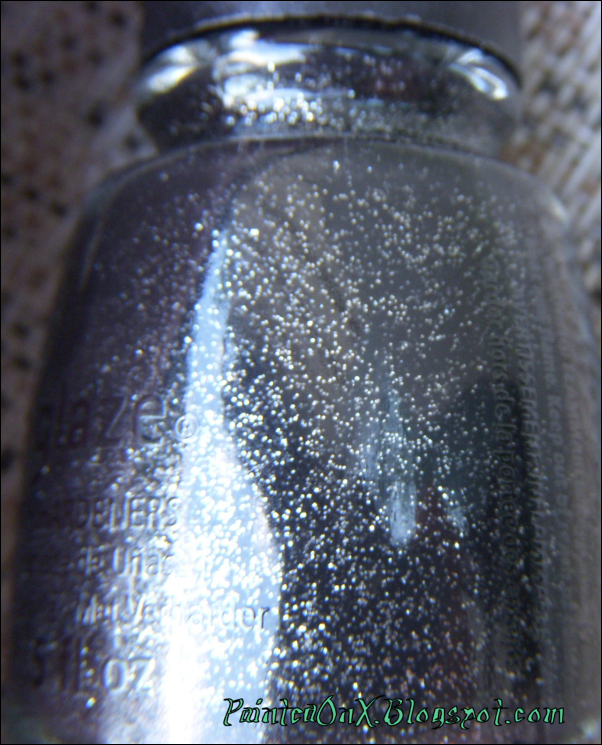 This holographic polish is more grainy. The rainbow effect you see in it is more scattered where with true holographic polishes it's more apparent. The pictures are a little dull. Still working on my lighting and camera settings. Thanks to all of the girls who left me all the great tips! I tried to show the beautiful color in different types of light and with a flash. 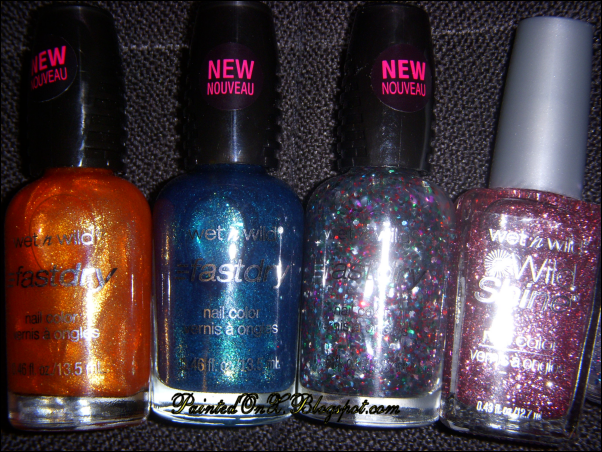 I'm also going to do a comparison with the other 2 silver holographic polishes that I have. OPI - Have You Seen My Limo? First of all I would like to say thank you!!! to Super Cute Super Easy for Awarding me. Definitely go check our her blog she is super talented. Dark plum duo-chrome with green shimmer. This color is amazing. I really tried my best to capture what this color does in different lighting. So I need to do something about my pictures. I feel like they don't capture very well on my camera. Definitely going to need some source of light come winter and the light is gone before I leave work. Any suggestions? Sorry about my rambling on. What do you think of "Have You Seen My Limo? "...How would you feel about a layout change too? I think I'm starting a little early for me anyway on the dark fall colors. I have been searching everywhere for this color. I finally stumbled upon the last bottle at a Rite Aid a couple of weeks ago. I've been dying to wear it. Thinking Vampy? A blackened/dark burgundy base with red flecks. It applied wonderfully. 1 good coat but 2 just because. It dried super fast. I didn't wear a base or top coat, and it shows my ridges really well. I love it anyway. What do you think of Rich In Heart? How do you feel about Sinful Colors polishes? 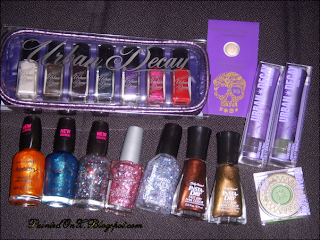 I have added some new members to my out of control nail polish and makeup collection! Please keep in my I bought this over the course of 2 weeks. The Urban Decay stuff was purchased 2 weeks ago and arrived today and the polishes were bought throughout the week, since I have an addiction I find myself in Walgreens about 4 days a week. Wet n Wild-Fast Dry in Orange 9.0.2.1.Orange (boring name huh?.. my mom was trying to find me Sally Hansen in Pumpkin Spice, no luck so she bought me this. I love her.) Thank you to S.N for the correction :) I take back what I said about the boring names. 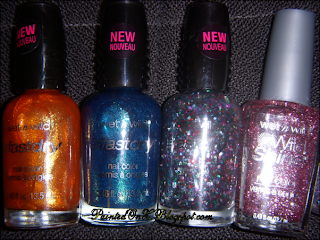 ..all of these Wet n Wild polishes were on sale this week at Walgreens for 99 cents. 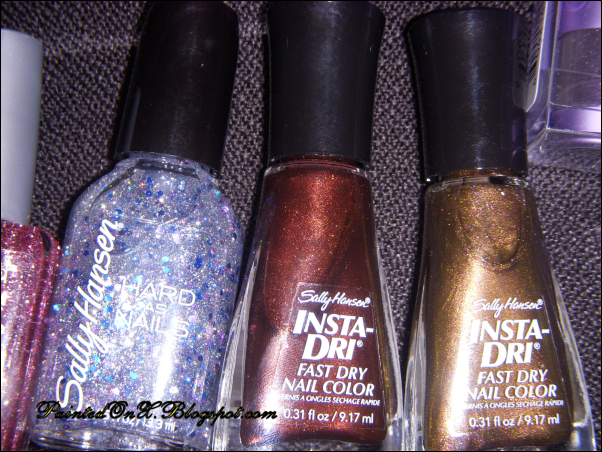 Got some new Sally Hansen polishes while searching again for Pumpkin Spice. ..the Sally Hansen Insta Dri polishes are from a Limited Edition Fall 2011 Collection. Don't know if the collection has a name or not. From Left to Right: White Widow, Gunmetal, Apocalypse, Grunge, Meltdown, Big Bang, F Bomb. 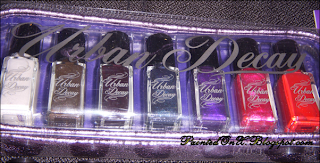 I couldn't pass up Urban Decays clearance sale they were having a few weeks ago on their site. Everything was so cheap. These are the polishes from the Apocalyptic Nail Kit. I got this kit with 7 Polishes for $8.00. Regular price was $30.00 I think. Maybe more. Good thing I never paid that because that is a rip off. 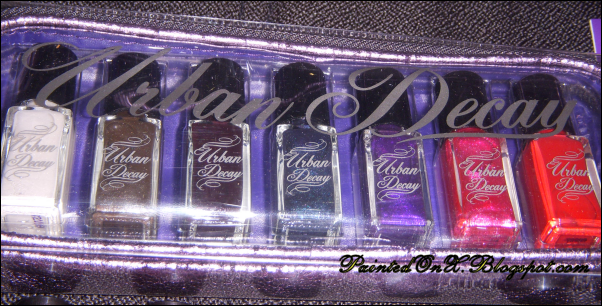 I got these in the mail yesterday and sat there thinking.."really Urban Decay. How cheap are you people?" 5ml. Theses things are so small! I think I have more in my Benefit High Beam sample. Ugh! 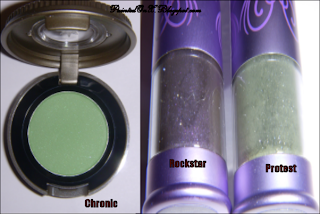 ..the loose pigments were on sale for$1.00 and the Matte eye shadow's were on sale for $3.00. Did you pick up anything cool this week? Do you want to see anything fully reviewed? Let me know, I love all of your comments and suggestions. Just like everyone else, I must post my swatches of China Glazes "It's Alive". You know I just feel that there should be a "!" after "It's Alive!". I don't I'm strange. Anyway... This is the real glitter of the collection, I feel. Waaay more glitter than Haunting had. 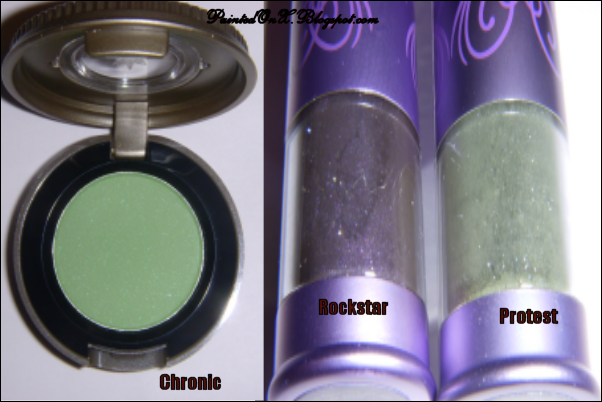 It's a green base filled with green and yellow glitter. It applied like a nightmare. Just what I had suspected. It looked nice from FAR away, but if you got up close you could actually see where there are dents in the polish since it applied too thick and chunky like, I know this is 3 coats but that's only because It looked this way with 2 coats and I tried to fill the spaces in..it only got worse. 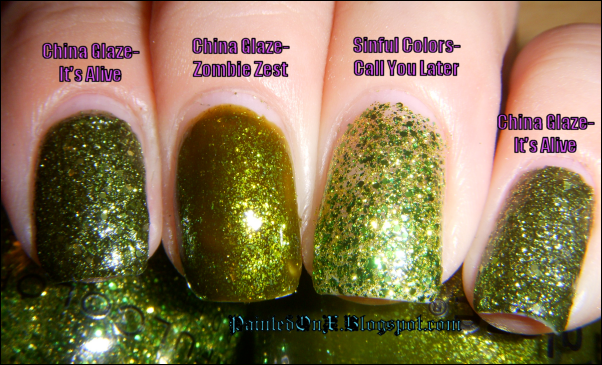 ...and like everyone else it doing, I feel I need to show my comparison to last years "Zombie Zest:"... Not comparable at all. I also showed it next to Sinful Color- Call You Later. Do you have a comparable color to "It's Alive"? Do you have any colors from the new "Haunting" Collection?